Even no-dig gardeners still need garden tools for some tasks. You might need a spade to whack a mozzie with (that's mosquitoes or skeeters for those who don't know down-under slang)... you might find a garden fork handy to spear a spud with to pop on the barbie (barbeque). 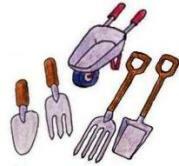 And of course, you'll need garden tools to dig plant holes with. Tools for gardening come in all shapes and sizes and are made from some pretty hi-tech materials these days. All materials have pros and cons associated with them, but some tips on buying and maintaining garden tools will surely help you save time, money and effort. The best thing to do is go into the market armed with information and make your own decisions about the garden tools that are specifically suited for you. Weight and balance: This is important--determine what you need and test the range available. Quality: Spend as much as you can afford to get a good quality garden tool as it will last you many years. Choose the right materials for the workload. Wooden handled garden tools will absorb vibration well but can be heavy. Fiberglass handled tools are strong and lighter in weight but reverberate with every strike and can be tiring to use all day. Aluminum handles are generally used for long handled gardening tools, such as pruners to make them more manageable. They are suitable only for lightweight working chores where no leverage or lifting will be applied. Plastic is often used for handle ends on shovels or heads on rakes. The plastic blends are much stronger these days as a material but can perish and split if left in sunlight. Carbon steel tool heads are generally good value but can be subject to rusting. They should be wiped clean after use with an oily rag to prevent rust forming on the surface. Stainless steel tool heads are mostly good quality but can be expensive to purchase. They won't rust but may stain if not cleaned after use. Maintenance Take good care of your tools. For hand tools a small sharpening stone will keep blades sharp and working well. For larger hand tools, a medium grade file will keep metal edges sharp so they perform at their peak. Protection Wipe down your tools after use and put them in a dry storage space. Constant dirt and weather exposure will damage all tools, no matter what they are made of. Safety Stepping on a rake hidden in grass can do real damage (despite how funny it is in the cartoons!) Paint the handles of all garden tools bright red, or use a fluorescent spray paint. Bright colors on gardening equipment also help you to find where you last put something down! Hang up your long handled tools if possible to avoid them becoming a tangle in the shed.